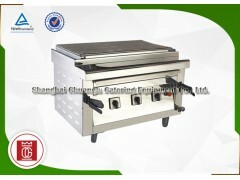 Shanghai Chuanglv Catering Equipment Co., Ltd.
Shanghai Chuanglv Catering Equipment Co., Ltd. which is the 1st and the top 1 manufacturer of teppanyaki grill table, hibachi grill, fish grill, lamb grill, etc. in China with 25 years of experience. We have supplied teppanyaki grill tables to more than 85% of the domestic users including Akasakatei, 57° Xiang, and Sheraton Hotel, and have exported our teppanyaki grill table, hibachi grill, BBQ grills to more than 50 countries and districts including Teppanyaki Alaturka in Turkey, Kobe Jones in Australia, as our equipments have been approved with ISO 9001, CE, CSA organizations. We have our own patented technologies for all our equipments and we also have our own brand GREENARK for our teppanyaki grill table and OVEN GRANDMASTER for our all BBQ grills. Our equipments are specially desgined for Hotels, Restaurants, Food Plaza, Buffet, Canteen, etc. Our electromagnetic heating teppanyaki grill tables have been approved by CE certification, our natural gas teppanyaki grill tables have been approved by CSA certification, and our electric BBQ grills have been approved by CE certification. Cookable Material Meat Steak, Meat Kebab, Seafood, Shellfish,Vegetable,Mushroom,etc. Meat Steak, Meat Kebab, Seafood, Shellfish,Vegetable,Mushroom,etc.